High Mowing Organic Seed’s post this week is just in time for those of us who live in zones with mid-October frost dates! And I love how clearly this group describes the fall crops you can plant – carrots, cauliflower, cabbage, beets – and how to get a handle on when you should sew seeds to reap these beautiful crops in the fall. The cover of my new book published on Kindle in June. 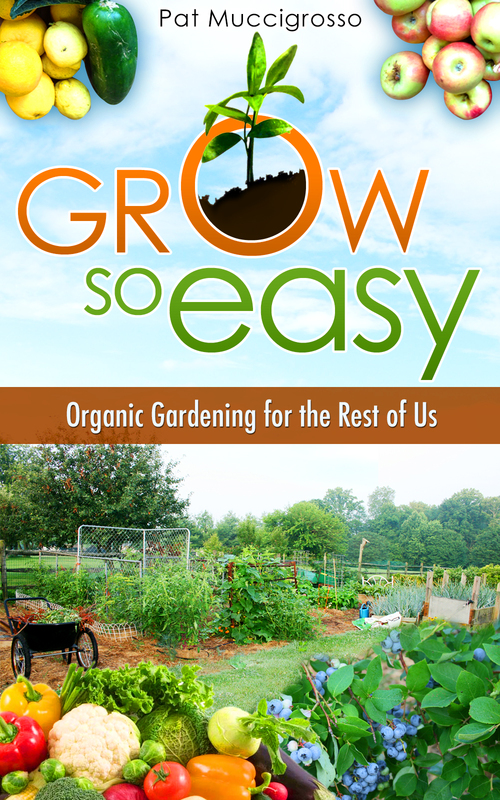 Enjoy their wonderful, well-written advice while I finish up with BookNook — the company formatting my Kindle book – Grow So Easy; Organic Gardening for the Rest of Us. Should be online within a week! Don’t Forget About Fall! Seeding Now for Autumn Abundance | High Mowing Organic Seeds’ Blog – The Seed Hopper. I got lucky when I married Italian because garlic is, was and always will be one of my favorite foods in the kitchen. And it’s one of my favorites to plant. Garlic is another crop that basically takes care of itself. If you get the right cloves to plant then give those cloves a good start in the right soil at the right time, you should harvest enough nice-sized bulbs of garlic to last through the year. My garlic harvest for 2012. My first thought is to tell you where not to buy. Don’t pick up garlic at the grocery store and expect to plant it and reap a big harvest. You might get lucky, but you may also be planting cloves that have been treated not to sprout. You could try buying garlic at a health food store but there is no way to know how viable it is. If you want to try to grow garlic that is already growing in the soil in your region, try a farmer’s market. Someone might be selling their garlic and you could get a good starter crop. NOTE: No matter where you get your first garlic bulbs, buy more than you think you will need. Plant them all. There are only two of us living here but I plant between 50 and 60 cloves of garlic (10 bulbs) every fall. Sounds like a lot because it is. But it won’t all get used in my kitchen. I share 10 or 12 bulbs but that still leaves 50 bulbs! How many cloves can an Italian wife (by association) possibly use? I actually go through about 35 heads a year. So what do I do with the 15 left overs? Most of them go right back into my garden. I plant them. I always plant enough so I can use my own garlic to raise my next crop. There are a couple of reasons for using this method. My garlic knows my soil. And it’s adapted to my climate. It grows faster and stays healthier because it is acclimated. DON’T PLANT GARLIC IN THE SPRING! If you do, you are doomed to fail. The garlic cloves you plant are considered dormant. They have to be exposed to cold temperatures in order for them to begin to grow and change from cloves to bulbs. If you plant in spring, the bulbs don’t get exposed to low temperatures (32 degrees to 50 degrees for 2 months). No cold means no bulbs, spindly growth and frustrated gardeners. Besides, planting in the fall means that Mother Nature gets to do all the work while you sit inside browsing through seed catalogues and dreaming of spring. Exact timing for planting day depends on where you live and yes, what zone you live in. In my old Zone (6), garlic was planted on Columbus Day, October 12th. However, with the slow warming of the earth, garlic planting day has moved back. In Zone 6b, I don’t put it in the ground until the end of October and, sometimes, even as late as the second week of November. Put it in too early and it sprouts then freezes. Again, you could lose your entire garlic crop. Planting when the world is getting frosty, the snow is falling and the wind is cold seems wrong and it would be if that’s all you did. But there’s an easy, cheap trick to keeping your garlic safe through the blustery winter months. I don’t mean sacrifice one of your blankets and toss it on top of the newly planted garlic bed! But you do have to cover your babies. The straw protects the bulbs from the cold, lets them overwinter safely and ensures they will be ready to start growing as early as March. But once winter is over, it’s really important to uncover the garlic as early as possible so the sprouts don’t rot. If they rot, you will lose your garlic crop. Here’s an easy tip for knowing when to uncover garlic (and onions). When the forsythia bloom, pull back the mulch. You may even find a few garlic bulbs already sprouted under there. Depending on your zone, you will probably get a few frosts after you uncover the garlic. Just toss something over the young plants to protect them. I use an old queen-sized mattress cover and drape it over the corners of the bed where the garlic is planted. How do you know when to pull the garlic up? Honestly, this has always been a struggle for me. And the more I researched and read, the more confused I got. Pull it up on this day/date. When the leaves on one or two start to brown, push the rest of them over, wait a week and pull them up. Wait until all the leaves on the plants are brown then pull them up. Aaaaaaargh…as one our most famous philosophers used to say! 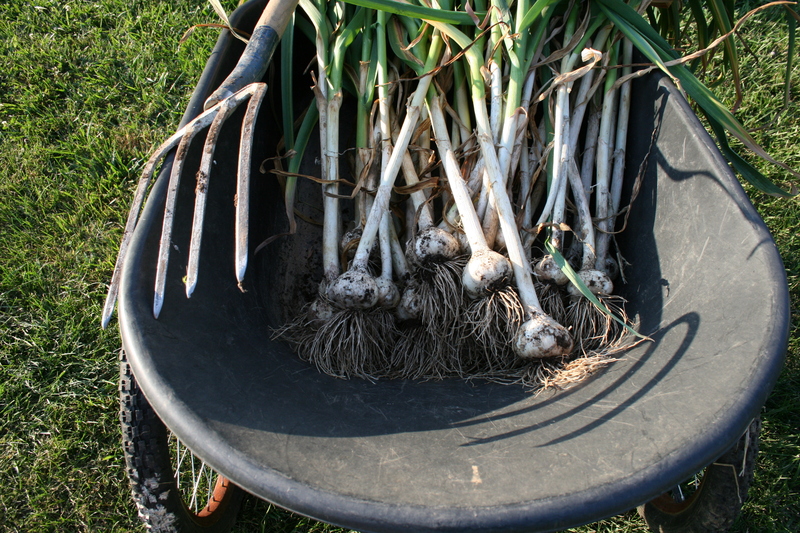 What finally cleared it all up for me was a simple, beautifully written article by one of my favorite garden gurus, Margaret Roach, who clearly understands the garlic harvest conundrum. Too early, and the bulbs won’t have time to develop to their full size. Too late and the bulbs will be over ripe, cloves will separate and the harvest won’t store as well. A word to the wise: healthy garlic develops a pretty serious root structure. Do NOT try to pull garlic up by its greenery! You will break the tops off and the garlic bulbs really need their tops to cure. So, what’s the easiest way to pull these babies out of the ground? With a garden fork – not the hand-held kind. You want a flat-tined, digging fork like the kind you would use to dig out potatoes, like the one you see resting next to my garlic in my wheelbarrow. Start about 2 to 3 inches away from the garlic bulb. Push the tines down into the earth, almost as far as they will go. Rock the fork front to back and side to side to loosen the dirt around the roots of the bulb. Keep loosening until you can easily and gently pull the bulb from the ground. Equally gently, lay the cloves into a wheelbarrow. Banging them will bruise them. As soon as all your bulbs of garlic are out of the ground, you need to get them out of the sun and into a nice, dry, temperature controlled space with good air flow. I use my shed. I lay down an old sheet, then place the bulbs side by side but not touching. I want air flow around each bulb. And if one’s going south, I don’t want it to take the others with it. Once you have them in your controlled drying spot, leave them alone for 6 to 8 weeks while they cure. (I do check them to make sure none are going bad…). When they are cured, If they’re soft neck, braid away. If they’re hard neck (what I always raise), you can cut the tops and the hairy roots off and store them inside. I actually put mine in a big tray and shove the tray under the dresser in my sewing room. The temperature is moderate in this room (I keep the thermostat at 62 in the winter) and the light is dim under the dresser. My garlic seems to keep perfectly there. NOTE: check the cloves about every 6 weeks, especially if there is any aroma of “garlic” wafting through the air. If you can smell the garlic, it means one of the bulbs is probably going bad. If you leave it in the general population, it may turn other heads bad, as well. Save 8 to 10 bulbs of your garlic for planting in October and November and enjoy the rest, all winter and spring.